We have produced an overview of how proposed new BSB Transparency Rules might affect Barristers from May 2019. The new rules are a result of the recommendations set out in the Competition and Markets Authority’s (CMA) Legal Services Market Study regarding price and service transparency. What are the BSB Transparency Rules? The BSB Transparency Rules set out the information that firms that are regulated by the BSB (Bar Standards Board)should make available to clients and potential clients. How will the BSB Transparency Rules affect me? Barristers must publish information on the prices they charge for certain services, under proposed new measures that were put out for consultation on 13th September 2018. The deadline for responses to the consultation is Friday 14th December 2018. 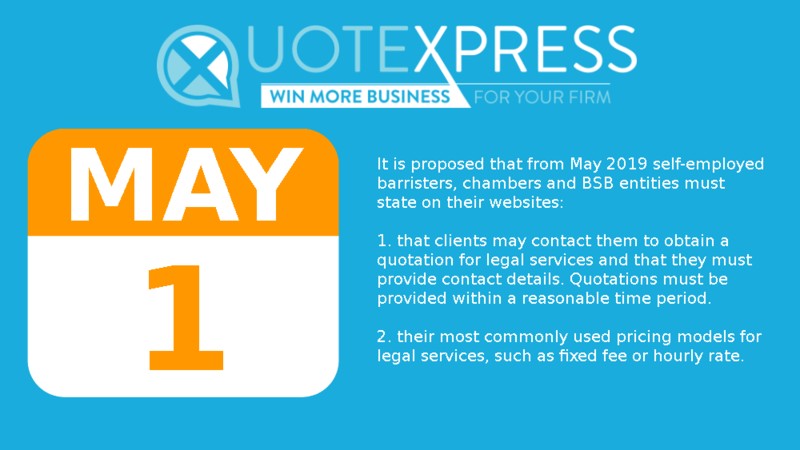 "The transparency rules will only apply to self-employed barristers, chambers and BSB entities. Barristers may work for an entity which is authorised by another legal regulator. For example, a law firm authorised by the Solicitors Regulation Authority. In this case, they will need to comply with the transparency rules of the other regulator. Barristers may also work in-house for an employer which is not authorised by a legal regulator. For example, a Government Department or financial institution. In this case, they will not need to comply with the transparency rules." • an indicative timescale for the key stages. Which Public Access services are covered by the proposed new rules? QuoteXpress can help your firm comply with the new Regulatory Arrangements and Transparency Rules by providing you with a Transparency Compliance Tool and Instant Quote Generator you can add to your website and help your firm to meet the requirements of the new rules. Sign Up For Free Today!